Brown’s Quality Automotive Services has the proficiency and competence to perform comprehensive, high-caliber CV Joints and CV Boot services. Our family owned company offers inspections, repairs and replacement CV joint and CV boot services. We understand that vehicle maintenance can get exhausting and expensive. We also understand that many people put off much needed car repairs and maintenance services for fear that it will cost too much and be too inconvenient. Here at Brown’s Quality Automotive Services, we believe that everyone is entitled to superior quality automotive services at a fair price. All of the auto repair services we offer are always set at an extremely competitive rate and our comprehensive CV joint and CV boot services are no exception. We know our reasonable prices will entice you, and our high quality service and friendly mechanics will keep you coming back. The CV joint, or constant velocity joint, is part of your vehicle’s drive shaft. The drive shaft is attached to your vehicle’s transmission at one end and the wheel at the other, allowing power to be transmitted, resulting in the movement of the wheels. The CV joints in your vehicle are created to bend in any direction while the drive wheels turn at a constant velocity. 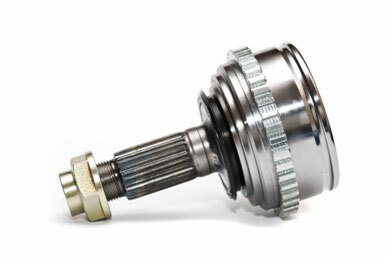 CV joints are most commonly used in the drive shafts of front wheel drive cars but are now often used in rear wheel and four wheel drive vehicles too. The CV Boot is a rubber covering that protects the CV joint from dirt and other miscellaneous particles that could compromise or damage the CV joint. The CV Boot is also responsible for keeping the CV joint lubricated which is important because of its constant movement and friction during vehicle operation. What causes damage to CV Joints and CV Boots? Regular wear and tear on a vehicle can cause damage to the CV boot which in turn can harm the CV joint. When a CV boot cracks or tears open, the CV joint is left vulnerable to dirt and other contaminants, which can quickly damage the joint. Torn CV boot replacements are a common automotive service, however if this service is delayed in could result in the need to replace the CV joint as well. Additionally, cracks in the CV boot could cause grease to drip onto your breaks which is a driving hazard that can be extremely dangerous. CV boot replacement typically costs a fraction of CV joint replacement which is added incentive to add CV joints to your routine car maintenance list. How will I know if my CV Joint or CV Boot needs to be inspected, repaired or replaced? Brown’s Quality Automotive Services is so confident in our services that we offer a 12-month, 12,000-mile warranty on all major repairs. You can rest assured that your vehicle will be repaired correctly the first time – We Guarantee It! Contact us at Brown’s Quality Automotive Services today to schedule an appointment.